. . . After the NASA/Goddard purchase, the next brave souls to take a chance on Amdahl were two universities. The University of Michigan, which became the second customer, used the 470 in its education center, where students learned programming. 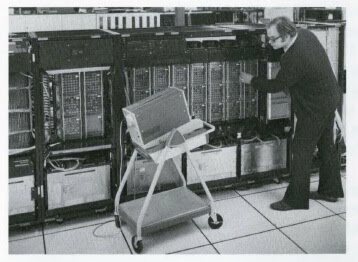 Texas A&M, the third customer, used the Amdahl computer to meet education and administrative requirements. In mid-I975, when the machines were purchased, the two schools were rivals, particularly in the area of data processing technology. So, when Texas A&M learned that Michigan had purchased the second machine, they were a little upset . "Texas A&M had been talking to us on and off, but didn't think we were really serious about building a machine that would compete with IBM's," says Jim [Shaw, director, Market Development, Planning and Analysis]. "However, when Texas A&M heard about the NASA installation and the Michigan purchase, they were at our doorstep. They literally walked around and kicked the doors on the machines like you do to the tires on a used car, and said, 'Is this really real?' " They grabbed the third machine, and from that point on, academic institutions became an important segment of Amdahl's customer base. . . .
. . . Bill Ehrman, hired in 1975 as one of the first SEs (system engineers), recalls the high-spirited comradery that evolved during the 470 installation at the University of Michigan, our second customer. "Gene White would get on the company intercom about twice a day and provide a status report on the installation ," he says. "In those days we lived by a simple, but meaningful slogan: 'It is better to ship than to receive.' " . . .
. . . Bud [Enochs], who was instrumental in developing AMDAC - Amdahl's Remote Diagnostic Assistance Center - has fond memories of the early installations, especially the one at the University of Michigan. "Dr. Bartels, director of the computer center, was obviously very excited about the installation," recalls Bud. "Although he was well into his sixties, he ran around like crazy, helped to unload the truck, pushed the machines around, operated the elevator - things a data center director usually doesn't do." Bud ended up doing some things he normally didn't do, either - like playing air conditioner repairman. One hot, muggy night, the rubber hose in the computer room's air conditioning system malfunctioned. Since computers cannot operate in an un cooled room, the data center was going to shut down. But just in the nick of time, Bud had an idea. "In the middle of the night, I went to my car, lifted up the hood, and removed the air vacuum hose," he says. "Then I went back to the computer center and replaced the broken hose with the one from my car. The system continued operating for several days." But the achievements of that early installation went beyond home remedies for broken air conditioner systems. The most memorable coup was a record-breaking engineering change. It took sixteen hours to implement - one of the fastest engineering changes in Amdahl's history. "We had a channel bug," Bud recalls, "that was created by the university's teleprocessing controller. When we finally figured out what was wrong it was two in the afternoon. We took our spare MCC, rushed it to the airport, and sent it to San Jose. An Amdahl courier picked it up. Then things began to happen fast. A manufacturing employee came in for rework. She finished about ten or eleven at night. By seven the next morning, that MCC was back in the 470 at the University of Michigan - and the computer was up and running." . . . The top center photograph is Amdahl 470V/6 P2 at the University of Michigan Computing Center.
. . . From the beginning Canadian customers have shown an enthusiasm for Amdahl products. According to Charlie Pratt, Amdahl's first account executive for the Western Region (which in 1976 included all of Canada), the first machine installed at the University of Alberta was bought-not sold. In fact, the University had been interested in Amdahl's design from the beginning and was involved during the research and development stages of the original product. of the United States (U.S.). The installation was handled by a Sunnyvale team, headed up by Ed Cardinal, then, senior field engineer. Shortly after, Ian Lanouette, a Canadian expatriate who had been working in Engineering Bring-up, was assigned to the University of Alberta to replace two local FEs that had resigned. . . .
Amdahl's first customer was NASA in New York City. The system was installed in an area "not much bigger than a large closet," Charlie [Pratt, the first full-time U.S. salesman,] says. This successful install was closely followed by ones at the University of Michigan and Texas A&M. By late 1975, the company was even ready to hold its first national sales meeting-five people around one table in a Holiday Inn in Ann Arbor, Michigan.